Trevor Nunn’s 1998 production for the National Theatre takes an impressively gritty approach to the show which undercuts the popular notion that musicals are all cheery jazz hands and nothing more. Yes there is splendid choreography from Susan Stroman which sparkles with a marvellous joie de vivre but it comes in scenes when people are coming together for a good time, market day or the big ball, and they are captured beautifully here. But alongside this, is no attempt to hide how tough day-to-day life is for these people and the violence that underscores much of life on the ranches and farms. It’s a bit of an odd DVD in that the video quality is not the best it has to be said, and the cameras often keep moving in odd ways, the overture plays out with scenes from the show superimposed onto the curtain and us watching the back of the audience’s heads and though it is apparently being filmed live in front of an audience, they only clap at the end of acts. But once you get used to how it all is, it ain’t too bad. Maureen Lipman’s gun-toting, sharp-speaking Aunt Eller is firmly at the centre of this production, highly perceptive of all that is playing out around her as cowboys flirt with farmgirls but feelings run incredibly high. Josefina Gabrielle was pleasingly excellent as the spikily characterful Laurie, her laughing face is one of the most beautiful I know. She also gets to use her ballet training to deliver her own Dream Ballet to gorgeous effect with Jackman also dancing himself. He makes a very strong leading man in Curly, charismatic, funny and powerfully voiced, and together they form a well-matched couple, their sparring clearly born out of the sparks of passion: it does not hurt that he looks mighty fine in his cowboy threads and gets a shirtless fighting scene towards the end. Shuler Hensley’s taciturn Jud is an unnervingly dangerous presence who threatens to put a spanner in the works and there’s good supporting work from Peter Polycarpou, Vicki Simon and Jimmy Johnston. 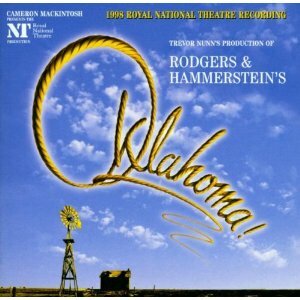 As a DVD, it shows its age a little too much as technological advances mean our expectations are higher but as a record of theatrical experience, this Oklahoma! comes across as a fantastic piece of work. It clearly points to the type of reinvention that was obviously being aimed for with the recent South Pacific, but where that fell mostly flat, this crackles with vitality, renewed depth and sparkling chemistry between its leads and indeed throughout the whole company. As the rendition of the title song starts off the final scene with some fabulous harmonies, my heart goes out to those who don’t get pleasure from classic musical theatre done to this exceptionally high standard, and the bittersweet kick in the teeth that then follows shows just the breadth of emotion and drama that good musical theatre can encapsulate.